One Hundred Aspects of the Moon - Considered his masterwork, Yoshitoshi's series One Hundred Aspects of the Moon features one hundred oban size woodblocks, published between 1885 and 1892. These quiet and reflective prints, beautifully composed and drawn, feature subjects from traditional Japanese and Chinese history and legend, rendered with great sensitivity and emotion. The moon appears in all but a few prints, providing a unifying motif for the series. 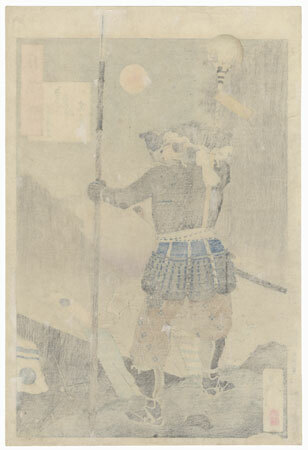 Yoshitoshi's innovative designs for the Moon series are often elegantly spare, with simple backgrounds that focus attention on the human figure. He combines the western influences of realism and perspective with qualities from traditional Japanese and Chinese painting, such as the emphasis on calligraphic brushstroke. The figures are carefully drawn with beautiful linework, conveying a real sense of individual character, gesture, and emotion. Special printing techniques such as embossing and burnishing add a sumptuous touch where appropriate, but simple subjects are conveyed in a likewise manner, no less carefully observed. 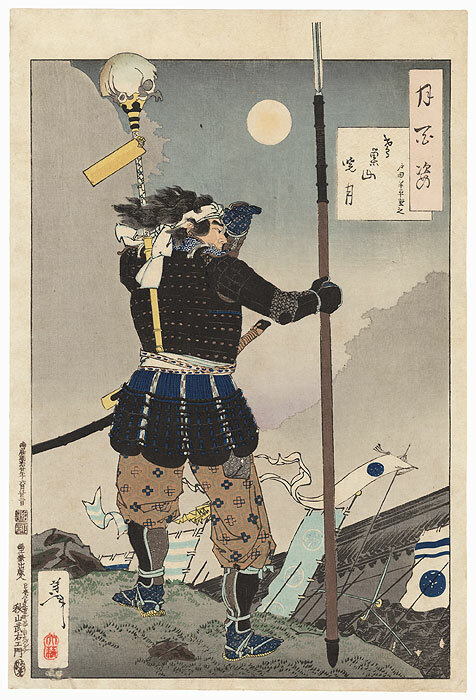 Prints from the series were released singly or in groups every few months, with the final image completed shortly before Yoshitoshi's death. The series proved tremendously popular, with patrons lining up to purchase the new releases as soon as they became available. 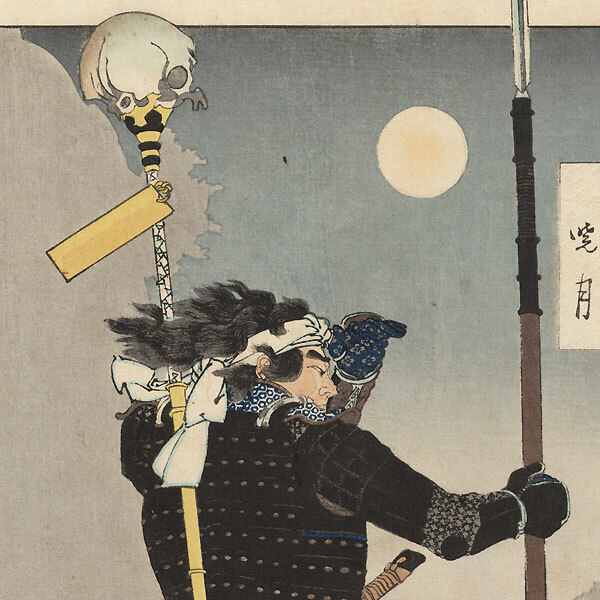 Today, One Hundred Aspects of the Moon remains Yoshitoshi's most well-known work, characterized by his artistry, compassion, and sensitivity in portraying the human experience. Mount Tobisu Dawn Moon - Terrific image of a general standing atop a hillside, shading his eyes with his hand as he watches his troops in battle below. His eerie personal standard is topped with a human skull, and he presents an imposing figure in dark colors against the softly shaded night sky. A great composition with the tip of the spear extending past the top edge of the image. Nicely detailed with burnishing in the armor. Condition - This print with excellent color and detail as shown. Small tear and hole at edge, repaired. Slight toning, a couple small spots, slight rubbing at corners. Please see photos for details. Good overall.